Enjoy your film. I got a decent pre-order price on Chili. It's available to watch now so I'm about to watch. Plus I can stream to Chromecast with Sky Store (which is a must for me getting digital copies). No brainer. You're welcome. I'm guessing you've cancelled the Amazon order if this Sky Store offer works out better for you? 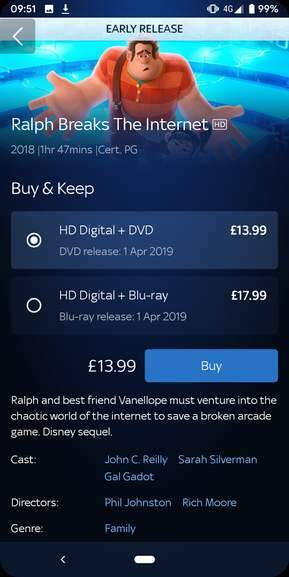 Just out of interest from when you have received them, is the £5 voucher just a £5 credit for Sky Store which can be redeemed against anything on Sky Store, just DVDs, just Blu-Rays etc? You're welcome. I'm guessing you've cancelled the Amazon order if this Sky …You're welcome. 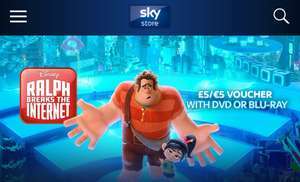 I'm guessing you've cancelled the Amazon order if this Sky Store offer works out better for you?Just out of interest from when you have received them, is the £5 voucher just a £5 credit for Sky Store which can be redeemed against anything on Sky Store, just DVDs, just Blu-Rays etc? Yeah I'll cancel my Amazon order now. Unless they changed it recently it applied to anything on the Sky Store, …Unless they changed it recently it applied to anything on the Sky Store, including offers A long time ago they would send out codes everytime you got a movie so you could end up with a few free titles for paying once Yeah I'll cancel my Amazon order now. Thanks for confirming this. 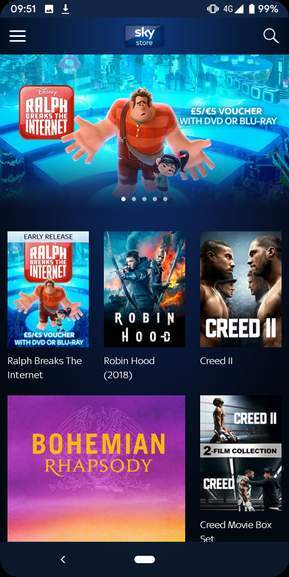 I'm currently watching Ralph Breaks The Internet on Chili, as I got it cheap using a code on a pre-order.